Harold Parlier, 78, is living on borrowed time and grateful for every minute of it. Last summer, he was diagnosed with metastatic melanoma that included several brain tumors. The prognosis gave him about four months to live, and Harold’s doctor referred him to Memorial Home Services – Hospice. In November, as part of Memorial’s home hospice team, Fran Gifford, BSN, RN, began weekly check-ins with Harold and Jo, his wife of 57 years. She oversees symptom management, checks vitals, monitors and adjusts medications, obtains orders from his physician, cleans the port every month, checks for skin tags, discusses concerns and answers questions. Harold was weak during Fran’s first visits. He slept most of the day, suffered from vision problems related to previous immunotherapy treatments and didn’t have energy for basic activities. Upon arrival, Fran adjusted several of Harold’s medications, which provided nearly immediate relief for several symptoms. He is the longest living patient on Fran’s rotation. She noted that too often people wait to request hospice services or don’t realize that Medicare covers nearly 100 percent of the cost. Thanks to the home hospice team, Harold and Jo have a built-in support system to guide them through their journey. This summer, Harold and Jo walk three to four times a week at Jacksonville’s Community Park, play Scrabble and host family and friends in their home. Mostly they rely on their faith and enjoy every minute together. 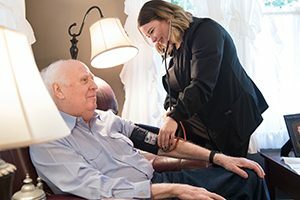 Memorial Home Services – Hospice is not a place but rather a comprehensive and coordinated program that offers compassionate care to the terminally ill and their families. For more information, call 217-788-4663 or 800-582-8667.